If you feel anxious whenever you don’t have your cell phone handy, we have a message for you: Ditto. Ditto is a tiny, lightweight wearable that vibrates when you receive important texts, calls, or emails. 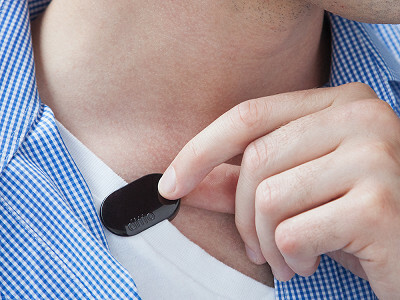 Clip Ditto anywhere on your clothes, or wear it like a watch with the Ditto Clip, and you’ll stay connected without needing your phone. And don’t worry: it won’t be vibrating constantly. You tell Ditto which senders are important, and which to ignore, with the Ditto app. You can even set different kinds of alerts for different senders or types of communications. Ditto also informs you—via its “tether mode”—if you're too far away from your phone. That’s good news for those of you (us) prone to leaving devices at coffee shops. Powered by a watch battery, Ditto doesn’t need to be charged. It’s waterproof, so you can even get alerts during a swim. You can also set a personal wake-up “call,” which won’t disturb others. Stay connected hands-free . . . and phone-free. Hello everyone! I'm proud to introduce Ditto to The Grommet. I'd be happy to answer any questions you have! Why is this a device people should look into? Ditto was designed to improve your life. It’s a product inspired by the loved ones around you that demand and deserve your full attention. Ditto is much more than a notification device, it’s a sign of respect when you’re sharing coffee with a friend. It’s the gate keeper to your precious time and attention. It’s first thing you put on in the morning, and the last thing you take off at night. Ditto was designed for you. Ditto is also much more than an impulse buy. It’s a platform through which we can improve and enhance the way you use your smartphones for years to come. We spent a good portion of our development time on making Ditto an updatable product; meaning, your Ditto will always work! We have a beautifully simple technology built into both the Ditto and the App that allows you to wirelessly update your Ditto to the latest software available. This allows us to publish bug fixes, small changes, major changes, and even new features! This is the definition of a disruptive advancement, especially at a $39.95 price point. Products and business go hand and hand. You can’t have one without the other. When we came up with the concept for Ditto, it quickly occurred to us that countless other people could benefit from such a simple, easy to use device. The obvious next step was to go ahead and make it a reality and see how the market would react. Kickstarter was the vehicle through which we tested and validated the products concept, and here we are now! The product is ready, we’re shipping and people are buying. It’s truly a beautiful process. Countless… Where to begin? Developing products in general is not for the faint of heart. Whether it be a Ditto, a keyboard, or even a shower curtain, every product has its challenges. At first glance, Ditto is a pretty straightforward product. No buttons, switches, screens, etc. But the technology that drives Ditto is actually quite complex. Creating and actually manufacturing a hardware device of Ditto’s size, beauty, capability and low cost (high value) was not easy. Receiving and submitting notifications to Ditto on both iOS and Android platforms reliably is without a doubt the biggest challenge we face. The good news is that we are reliable, extremely reliable, and we continue to focus on further improving Ditto’s overall performance. Will this work with the iPhone 6+? @Arthur Yes, Ditto is compatible with iPhone 6+. For Apple devices, Ditto is compatible with iPhone 5 and above. For Android devices, Ditto is compatible with Android systems 4.4 and above. Will it only interact with a phone? Is there a way to create an interaction with other objects? At this time, Ditto is designed to only work with smartphones that have Bluetooth Low Energy (BLE) capabilities. This includes iPhone 5 and above, as well as most of the latest Android devices. Will this be available for Windows phones? Unfortunately at this time, Ditto is only compatible with Android and Apple devices. How far away can your cell phone be? @Virginia This has to be a BT device so max range of 30 feet. In common indoor environments, Ditto will recognize your phone in a range from 25-35 feet, which is the average range for Bluetooth devices. However, this range changes depending on one's surroundings. In very open environments, for example, we have successfully tested Ditto recognition for over 100 feet. I was part of the kickstarter launch and received my Ditto a couple weeks ago. My battery only lasted 3 weeks. The product states 4-6 month battery life. Does the Grommet stand behind the 4-6 month battery life promised? The battery life is very much dependent on one's use. If one uses Ditto very heavily - i.e., sets long vibration patterns for every notification, sets many alarms - the battery will deplete more rapidly. For what we consider average use, which involves the use of different filters for different notifications, the battery should indeed last many months. If you feel like you have more questions about your specific case, feel free to reach out to us as [email protected] and we will be happy to resolve your issue! What is the range of the Ditto? How close do you need to be to your phone? What phones and/or OS's does it work with? @Sarah This has to be a BT device so max range of 30 feet. For Apple devices, Ditto is compatible with iPhone 5 and above (running iOS 8.4+). For Android devices, Ditto is compatible with Android systems 4.4 and above. They also need to be Bluetooth Low Energy (BLE) compatible. Does this require any service other than what is already available on one's Android phone? This works with Android phones that are running system versions 4.4 and above. The phone also needs to have Bluetooth Low Energy technology, which is included in the majority of recent Android phones. Hi what is the range? It says you can be in another room..I assume this works off of Bluetooth. I would love to give this to a loved one as a gift -- but she has two cell phones (one work, one personal, both iPhones). Can you set up one Ditto to work with two phones? At this time, to keep Ditto's function simple and most user-friendly, Ditto can only be paired to one phone at a time. Can it be set to link with a Bluetooth flip phone and simply buzz anytime there is a call or text (without using an app on the phone? Unfortunately, you do need to set up the app on your phone in order to connect with Ditto. This allows you to customize the vibration patterns for your various notifications (calls, texts, etc). I love this idea! Going to dinner & not seeing EVERYONE on their phones. What a concept! Will it work if your phone is OFF? Your phone does indeed need to be turned on such that Ditto can remain connected via Bluetooth. Ditto sounds like it might really be a help to me. I'm wondering what happens if a call comes in when I happen to be out of range. Would there be a signal from Ditto when I get back within range? Unfortunately no. Ditto receives notifications only in real-time: it receives notifications at the same time your phone receives the notifications. This helps maintain the simplicity of the product. Imagine you left your phone's range for an entire day, and receives many texts, calls and e-mails during that period of time. When you return into range, you probably do not want Ditto buzzing for 5 minutes straight! As a follow up to Abraham's question regarding the battery - is Ditto rechargeable or do you replace the battery or once the battery goes so goes the Ditto? @Tina Not rechargeable. It has a button battery. Ditto is not rechargeable. Once the battery runs down after it's 4-6 month life, you do need to purchase a new battery, which is easy to order online. Ditto uses a CR1632 Lithium battery. One battery will cost an average of $3 (but obviously, buying them in a pack tends to be better value). Hi James, I am excited to try this. Thanks for the insight. I was an early investor in Pebble, use an Apple Watch with a VIP List and this really is what I am looking for. Question: does this in anyway relate to the settings on the iPhone (6+)? For example, if the phone is made silent, no vibrate, does this device still vibrate? and does it have it's own profile for silent? Glad to hear you're excited! When the phone is made silent (no vibrate), Ditto will still vibrate. This allows Ditto users to keep their phone on silent in a variety of situations (meetings, shows) while still allowing the user to be aware of their desired notifications. Ditto does work in sync with the Do Not Disturb (DND) function on Apple devices. So, if you have DND enabled on your phone for a period of time, Ditto will not vibrate during this time. You can always also simply disconnect from Ditto when you don't want to receive notifications, and easily reconnect later. Hi! I see this product as a GREAT help for those who can NOT hear our iPhones while it rings due to hard of HEARING. It solves the problem by FEEL on my SKIN, and is a safe, light and easy to attach to wrist,outside purse. Besides it great when a unwanted noise, breaks up a doctors office visit, too! Thank you,SO much! Glad to hear it, Zima! Thanks so much for the kind words! @Mike I have an iPhone 6. When the new phones come out (as they do regularly), will this work on them? Since it connects via Bluetooth, you shouldn't have a problem with that, Virginia! Great question. When Ditto leaves the Bluetooth range and stays out of Bluetooth range for at least 30 seconds, the tether vibration goes off. The default vibration pattern for the tether is four vibrations, but the user can customize this pattern. So, if your wife leaves her phone in her car and walks into her office leaving Bluetooth range, the tether vibration will go off. The reason for the 30 second delay is to minimize the amount of "false" tethers going off when a user is still around their phone and leaves their phone's range for just a few moments, only to return into range. The user can also change this delay option from 30 seconds to 1 minute, 2 minutes, or 4 minutes. While 30 seconds, is currently the shortest delay option, due to popular user demand we will likely incorporate an even shorter delay option of 15 or 20 seconds in a future app update. How hard is it to replace the battery? Do you need any special tools? No, replacing the battery is incredibly easy. You can simple pop the battery out using a household object such as a toothpick, or the point of a ballpoint pen. You then simply place in the new battery. This video perfectly illustrates the simple battery replacement process. Presuming electromagnetic field (EMF) radiation is a health concern, does the Ditto have a lower EMF than a cell phone? Much lower, Janet! It transmits at a fraction of the power of a cell phone! this is what I've been looking for, I always forget to turn my ringer back on when I leave work, the other night my family tried to reach me about my mother and I had my ringer off, now I won't have to worry about it, I'll attach it my glasses if I have to, thank you so much, can't wait for it to arrive. Glad to hear it, Donna! Enjoy! Does the wrist strap come with it or does it have to be purchased separately and if so where? Hi Neil, it sure does! It is blue on one side and black on the other. I have a Sony Xperia Dual with Anroid 4.1.1, could this possibly work on my phone? I'm not sure it can upgrade to Android 4.4+. This is a great device because of noisy environments, or a thick coat over your phone. Hi James, if your phone is Bluetooth Smart Ready, you are in business. Because your phone is a 4.1.1. and not 4.4, there might be an app you can download to create a Bluetooth Smart Ready connection. Check out your app store! On my phone, I use 3 different email packages. Can Ditto be set up to work with all 3? Hi Art, you should be good to go. You will end up selecting individuals from those three email addresses to get those notifications. Ditto essentially works as a filter for your notifications so if your phone gets them, you can choose to get them on the Ditto. If you feel anxious whenever you don’t have your cell phone handy, we have a message for you: Ditto. 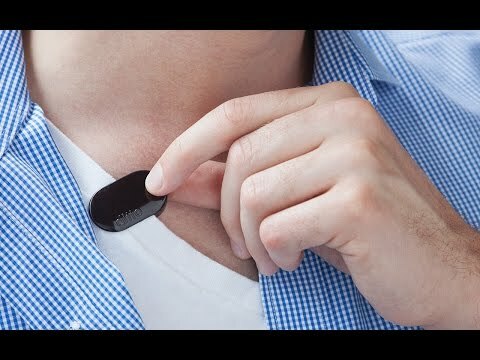 Ditto is a tiny, lightweight wearable that vibrates when you receive important texts, calls, or emails. 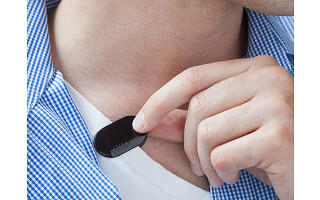 Clip Ditto anywhere on your clothes, or wear it like a watch with the Ditto Clip, and you’ll stay connected without needing your phone. And don’t worry: it won’t be vibrating constantly. You tell Ditto which senders are important, and which to ignore, with the Ditto app. You can even set different kinds of alerts for different senders or types of communications. Ditto also informs you—via its “tether mode”—if you're too far away from your phone. That’s good news for those of you (us) prone to leaving devices at coffee shops. Powered by a watch battery, Ditto doesn’t need to be charged. It’s waterproof, so you can even get alerts during a swim. You can also set a personal wake-up “call,” which won’t disturb others.